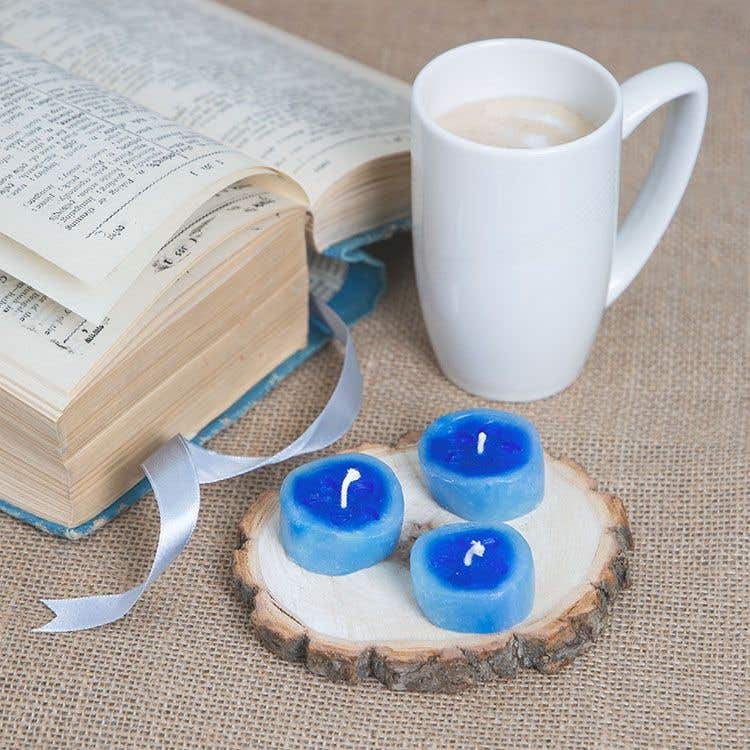 Add a touch of calm with these beautiful handmade tea lights, perfect for a cozy reading nook or place in jars for a perfect summer’s evening centerpiece. 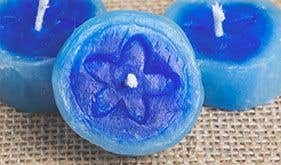 Take half a block of dark blue wax and mould around in your hands until soft. Roll into a sausage shape about 2cm in diameter and 7cm long. Take equal parts of white and light blue wax (about ¼ of a block each) and mould until soft. Mix together to make a marbled effect by rolling into sausages, twisting together and repeating. Roll the marbled wax into a flat sheet using a plastic rolling pin (do this on baking parchment so that it doesnt stick). 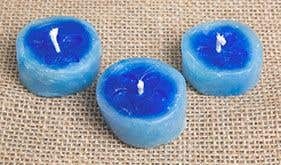 Place the dark blue wax on the end and roll the marbled piece around the outside. Pop in the fridge for 10 minutes to cool before slicing with a sharp knife. Cut the roll into 3 equal slices using a sharp knife. Use your fingers to smooth any edges. Press the flower stamp firmly into the centre of the candle. Use a cocktail stick to form a hole in the centre for the wick. Feed the wick through, using fingers to gently smooth any gaps around the top and bottom of the wick. 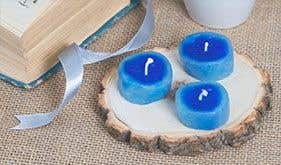 Place the wax in the fridge to cool before attempting to slice it into sections as this creates a cleaner edge and stops the candles becoming misshapen.